This year is the 50th anniversary of Malaysian independence. As such, It has been declared "Visit Malaysia Year 2007". They are are making a big effort, and spending a lot of money to draw in the tourists. If they want to draw in tourists, and improve the country's image in the eyes of the world, most of that money would be better spent improving the dismal state of the public restrooms. Oh, they are making some effort. There is a cute little commercial playing that seems to be urging workers to clean up and take care of the public facilities. But seeing as my Malay skills are not too good, it could also just be urging the cute little kids in the background not to poop and piss all over the floor. Lets face it- the public restrooms here are horrible. Most of them are not maintained even at a minimum standard at all. Worst of all, you have to pay for the right to use these crap houses. Normally, there is a bored looking someone sitting at the entrance, behind a sign asking 20 sen (about 5 cents) for admittance. Most of the places, I wouldn't even pay that much to get in, because they look like proving grounds for top secret biological weapons. If you want toilet paper and soap, that is extra, of course. The attendant looks bored beyond belief, and totally apathetic to anything going on around them. They act as if they can barely be bothered to take your money. God forbid you ask them to make change. That is a major annoyance, and aways met by a dirty look, because the stupid foreigner doesn't know enough to carry 20 sen in their pocket. If there is a problem, forget about trying to rouse them from their torpor. If you say something about a toilet overflowing all over the floor, or some other such problem, the general response will be either a blank stare of total what-do-I-care non-concern, a bitter look like you just ruined their life, or you will be laughed at as a stupid foreigner, who actually thinks they are there to do something other than exist in a catatonic state. 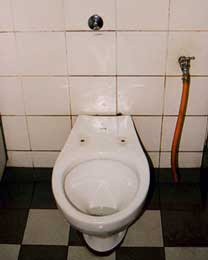 Lets face it, the way most of these places are maintained, you are better off urinating and defecating in your pants. It's much more hygienic than using one of these cesspools. What can you do, though? If you really have to go, the only other choice you have is to wait until you get to your hotel or other accommodation, or wait until you get to some other country. In my experience, the only other place worse than a Malaysian restroom are the walled in trenches that pass for restrooms in the villages in China. That's all they are- a trench in the ground, with no stalls, no privacy, no place to wash your hands, nothing. You drop your pants and grin stupidly at any others there while taking a dump. The only improvement a Malaysian restroom has over that is that it does have stalls, so at least you can have some privacy and dignity. There seems to be a nationwide contest for which place has the worst disease factory. There must be a law in Malaysia that all public facilities must not be mopped, fixed, maintained, or deodorized. 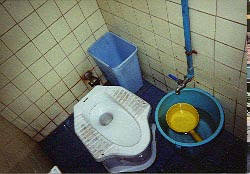 Some of the most noxious places in Asia are Malaysian public restrooms. They probably contribute as much or more to global warming than anything else in Asia. Yeah, the government wants you to visit Malaysia in 2007. But if they want your trip to be a little less adventuresome, and a lot more pleasant, then they should do something about these #@$%holes.